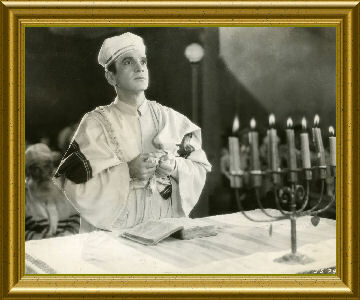 There is much to be said about Jolson's Judaism. It was, in many ways, so much a part of his identity. Though he was never an observant Jew, he would assault--verbally or otherwise--anyone who made an anti-Semitic crack. Jolson was, as his biographer Herb Goldman wrote, the first Jewish-American entertainer who did not hide his roots. There are many references to Yiddish and Jewish tradition in his films and radio shows. Yiddish was a second language to him, of course. The greatest influence on his Jewishness was his father, Moshe Reuben Yoelson. Moshe was a rabbi, a cantor and a mohel. It should also be noted that Jolson recorded the songs "Israel" and "Hatikvah" with Decca Records in May 1948 and donated all the royalties " to the United Jewish Appeal. Two days after recording the songs, he sent a master copy to Israel's new president, Chaim Weizmann (who at the time was visiting President Truman at the White House.) The story made the front page of "Variety." Jolson also did radio shows for the United Jewish Appeal in 1947 and 1948 and paid for a two-page ad in "Variety," urging funds for Jews in Europe. "It should be noted that an estimate of Al Jolson's estate, in 1950, was some four million dollars. That would be equivalent, in 2007 currency, of about $35 Million. Al Jolson took to heart the essential Jewish mandate of tikun olam, perfecting the world. It is a belief rooted in Jewish liturgy and practice to leave this world a better place than when you entered it, and from the variety of causes helped by Jolson's wealth, I think he helped significantly in completing this task. Here is a listing of the charities which benefited from bequests in Jolson's will. Wherever possible, I have provided web links to sites maintained by those charities or successors."